Time once again to celebrate the beer that helped put St. Louis on the beer map of the world. We’re of course talking about Czech beer and the celebration is coming next month with the return of the Great St. Louis Czech Beer Festival on December 10. The roots of this link goes back more than a century with the birth of Anheuser-Busch. Most American beers of the mid 1800s were darker, heavier ales. Adolphus Busch saw an opportunity to mass market a new beer, which was inspired by the lagers brewed in the famous Czech region of Bohemia. The rest is history. Czech beers are known for their signature use of the delicate Saaz Hops. Saaz Hops, from the Czech town of Zatec, made the small region now known as the Czech Republic into one of the leading suppliers of hops in the world. Saaz hops are also the only non-German noble hop. Traditionally Czechs only brew and/or drink two styles of beer: Pilsner and Tmavy Pivo. The latter meaning Dark Beer. These dark lagers share many characteristics with the Bocks of their neighboring Germany, but stand out due to the majority use of noble Saaz Hops. The Czech Beer Festival 2016 will offer a smorgasbord of good eats and great beer highlighted with these Czech imports. Pilsner Urquell translated from Czech means Original Pilsner. It was the beer that inspired the Bohemian region to make the Lager 85% of their national beer production as far back as 1865. Budweis is home of Praga and Czechvar originally known as Budweiser Budvar. In America the beer is known as Czechvar as a result of legal dispute with Anheuser Busch and their Budweiser lager. 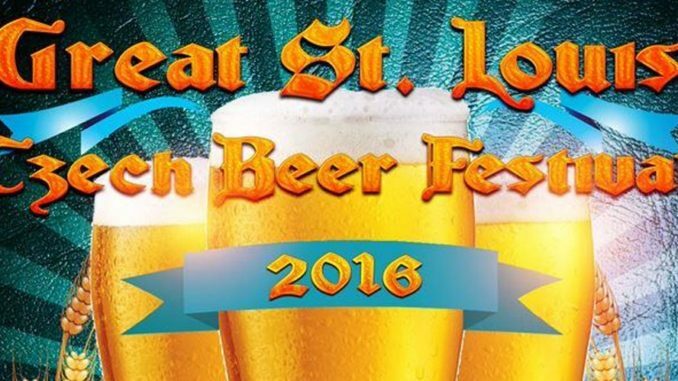 Speaking of the locals, the St. Louis local beer community will be well represented once again this year. More than 20 local crafters with more than 40 brews of all styles, will also be on hand. Attendees will have the opportunity to vote for The Pivo of the Year Award, which is given to one Czech style American pilsner each year. Past winners include Big Muddy Brewing Co. Czech Pilsner and Urban Chestnut Brewing Co. Vaclav. In the dining room you will find our unique Czech inspired bar food and appetizers for sale including paprikash meatballs, stuffed kolache, stuffed pickles, pretzels and more. Every ticket gets you 1 souvenir sampling glass, 4 hours of unlimited beer samples, live music during the duration of the event, and access to the food and merchandise booths. The tastings will begin at 1 pm and end at 5 pm with live music. The bar lounge will remain open after the Festival has ended, where guests can relax with a bottle of their favorite Czech pilsner from the event. Free parking lot is available. For more information go to www.stlpivo.com. You can also get a generous ticket discount by using the promo code “314pivo” to get $15 off all your tickets.